You’d think the traditional mince pie couldn’t be improved upon, but I think Aldi have changed the game with their salted caramel versions of the Christmassy treat, which are set to make a return to the supermarket’s shelves. There’s nothing like settling down in front of the TV with a mince pie and a brew as the weather turns icy, and as we’ve officially got to the point of being able to see your breath in the cold air, I’d say we can now declare the start of mince pie season. 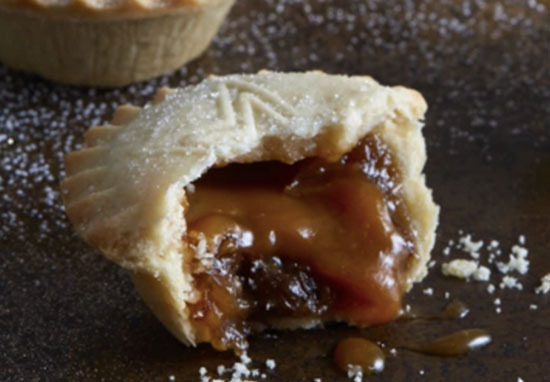 Aldi have taken the classic mince pie to the next level by combining it with luxurious salted caramel, and even though I’ve never tried one, I can pretty much guarantee they’re going to be a highlight of this year’s Christmas food – in my household anyway! The indulgent treats are set to go on sale from November 1, and at just £1.99 for a pack of six, there’s no excuse not to get your hands on some immediately. It’s only 33p per pie! The salted caramel mince pies are part of a whole festive collection from Aldi, who have chosen to take advantage of the popularity of salted caramel flavoured things. Other items in the range include a ‘Specially Selected Salted Caramel Vodka Pudding’, which, at £6.99 for a pack of two, consists of melt-in-the-middle sponge pudding which will a ooze salted caramel filling. Both the puddings and the mince pies will pair perfectly with Aldi’s salted caramel flavoured ice cream, which costs £1.89 per tub. You could buy every item and have the saltiest Christmas ever – in a good, caramel-filled way. Though the flavoursome mince pies are yet to hit the shelves this year, previous reviews of the salted caramel delights have certainly created some high expectations. Can confirm that the Aldi Salted Caramel mince pies are absolutely banging. Just tested the @AldiUK salted caramel mince pies,( obviously all 6- never can be too sure!). Great buttery pastry, oozing filling – sorry Santa, none of these beauties under the tree for you, Fight Rudolph for his carrot. I think Aldi have taken the lead in supermarkets this year when it comes to Christmas food, as the store have also come up with the ultimate addition to the Christmas dinner table – a foot long pig in blanket. Pigs in blankets are arguably the best thing about Christmas dinner, and, at least at my house, there never seems to be enough to go around. Aldi created the perfect solution by coming up with the foot-long version, and while it’s almost definitely been created with the intention of sharing, I think the ideal situation would be if everyone receives their own individual extra large pig in a blanket on Christmas Day. Aldi doing foot long pig in blanket for Christmas is sound I’ll have 10. I’ll limit myself to five, just to make sure there’s enough room for some salted caramel mince pies afterwards. The diet starts in January, right?